The collection is based on donations made by Nitobe Inazo in 1920, to which further acquisitions by this library were added later. 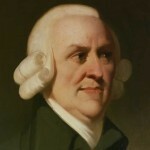 Separate from this collection is the Adam Smith’s Library Reference Materials (4 books). You can search this on UTokyo OPAC. The name “Adam Smith’s Library” will appear in the Collection field. If you would like to browse, select Adam Smith’s library from the pull-down menu in the Collection field on Advanced Search of the UTokyo OPAC, then click the search button. The following are catalogues which cover all books which were previously owned by Adam Smith, including those in the Library of Economics. Within these, the catalogue by Mizuta is the most detailed and broad. The catalogue of items held by the Library of Economics and included in the Mizuta catalogue is also a catalogue of Adam Smith books acquired by the Library of Economics after Yanaihara compiled his catalogue. The digital version of the catalogue of books within Adam Smith’s Library. Besides this collection, in Japan there are 13 titles 39 books which were previously owned by Adam Smith; these are held by 8 organizations and 1 person. Outside of Japan, Adam Smith’s books are held by the Edinburgh University Library, The Library of Queen’s University Belfast, etc.